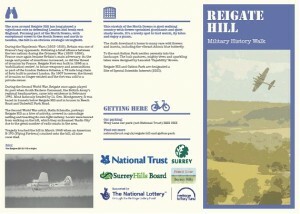 This Heritage Lottery Funded project saw the Surrey Hills Board, National Trust, Gatton Trust, the Surrey Youth Support Service and Surrey County Archaeological Unit work together to reveal the lesser-known military history of Reigate Fort and Gatton Park. The project, called Front Line Surrey Hills, was made possible by a grant of £54,000 from the Heritage Lottery Fund (HLF). 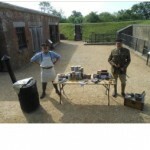 An exciting programme of educational and research events have taken place including garrison days at Reigate Fort, living history events and a series of walks and talks which have actively involved local communities in the exploration, conservation and interpretation of our local military heritage. Reigate Fort was built in 1898 as part of a 72 mile defence line to protect London from invasion. The Fort was used as a mobilisation centre, holding vital tools and ammunition to supply soldiers and artillery at short notice. It opened to the public in 2006 but had only basic access and interpretation. We wanted to bring the Fort alive for visitors and the local community. We planned to fit out the fort, provide school visits and family days, work with a living history group to create “Garrison Days” and, with a local theatre group, we wanted to put on a community theatre production based around the local military history. 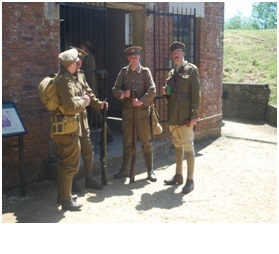 In the longer term we were keen for the Fort to become a base for exploration and interpretation of military history in the wider East Surrey area. The “observation post” was overgrown and neglected and we wanted to train and work with volunteers to undertake its conservation, record its structure and try to establish its origins and use. We wanted to contact the families of the crew killed in the B17 bomber, to create a memorial and interpretation at the site to enable visitors to understand the significance of the site and to raise awareness of its history within the local community. 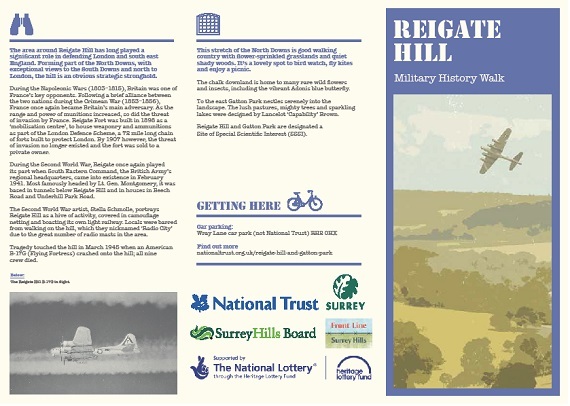 We also wanted to publish a self-guided walk leaflet for the many visitors who come to Reigate Hill and who may not be aware of the importance of the area’s military history.We wanted to contact the families of the crew killed in the B17 bomber, to create a memorial and interpretation at the site to enable visitors to understand the significance of the site and to raise awareness of its history within the local community. It was originally thought that the World War 2 structure on Reigate Hill was an observation post. However once the ground around it had been cleared it was decided that, due to the height of the windows, it was not an observation post. 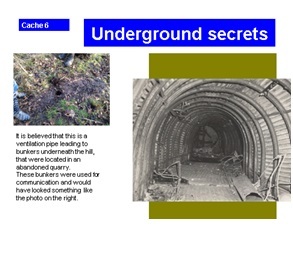 A 10cm hole was discovered in the roof, which could possibly have been a socket for a radio aerial, perhaps connected with the British Army South Eastern Command HQ which was further down the hill and in hidden tunnels under Reigate Hill, or it may even have been used by other wartime government departments to monitory enemy communications. It is known that during WW2 there were many radio aerials around Reigate Hill and the area’s nickname was “Radio City”. However despite a great deal of investigative work undertaken by the volunteer researcher and appeals to the public, including in the local press, no documentary evidence to support these theories was found. 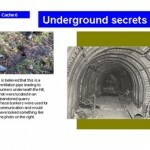 It is therefore hoped to carry out further research into its use as part of a future project looking at similar structures across the Surrey Hills. 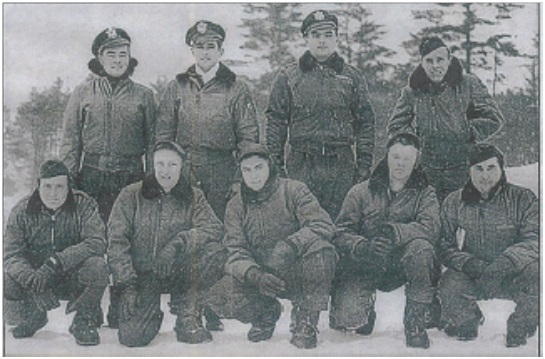 On 19 March 1945 the crew from the 384th Bombardment Group was flying back to its base at Grafton Underwood in Northamptonshire after an operation near the German/Czech border. Tragically as the ‘Flying Fortress’ neared Reigate it entered into a cloud bank and moments later crashed into Reigate Hill killing all those on board. In honour of the 9 US airmen who lost their lives, two memorial benches made of local oak were commissioned from a local sculptor. 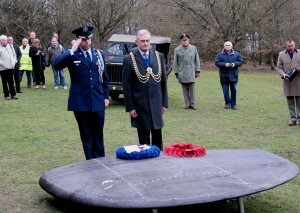 The benches take the form of the wingtips of the ‘Flying Fortress’ and were unveiled at a memorial service held on 19 March 2015, the 70th anniversary of the fatal crash. This was attended by over 100 people, including relatives and family representatives of the airmen, the US Assistant Air Attaché, local and county dignitaries, a representative from HLF, local history groups and members of the public – some of whom remember the crash. Click here to view further information about the commemorative event. A whole series of events took place to engage the public with our work. 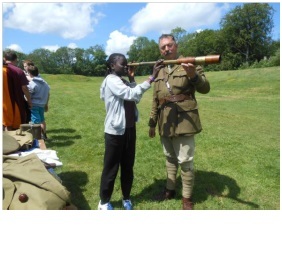 These were held at Reigate Fort and attended by over 75 children and 40 adults. 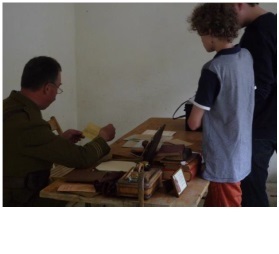 Families were able to take part in three different activities: geo caching, code breaking and Home Guard Training. Led by a member of the Gatton Trust and volunteers. Families borrowed GPS devices to follow a geo cache trail and explore the area around the Fort. In the hidden boxes they discovered cards telling them about the history of the Fort and the surrounding area during WW2. Led by a member of the Gatton Trust and volunteers. Children enjoyed making code wheels and using them to decode secret messages hidden within the Fort grounds. Led by Living History experts. Children took part in drill, rifle training, ‘grenade’ throwing and ‘bayoneting’ to gain an insight into the training which Home Guardsmen took part in during WW2. Nine school groups (260+ children) visited Reigate Fort looking at WW2 topics, including archaeology, Home Guard Training and crash site investigation. Pupils got the opportunity to take part in a mini-dig to discover artefacts using archaeological tools. 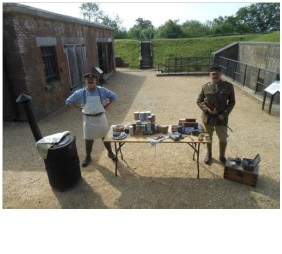 They then investigated the Magazine at Reigate Fort – measuring the rooms and searching for clues to its purpose. They then took part in drill, rifle training, ‘grenade’ throwing and ‘bayoneting’ to gain an insight into the training which Home Guardsmen took part in, in the area, in WW2. The children were told the story of the young men who lost their lives on the B17 bomber which crashed on Reigate Hill on 19 March 1945. 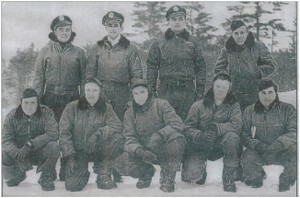 They took on the role of one of the men and found out about the conditions during their missions and visited the site to see artefacts which had been found there. Garrison Days: These were re-enacted by the 10th Essex Living History Group, who covered a huge expanse of history from the Viking invasions to WW2. The event included displays of marching and military practice as well as gunfire and explosions. 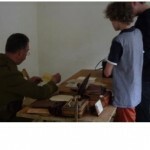 Children were given the opportunity to wield a sword or drill with a rifle, under the eye of a Sergeant Major. The event was attended by almost 600 people. Gatton Community Theatre commissioned a young playwright to create a play entitled “Tales from the Surrey Hills – Stories of highwaymen and smugglers, soldiers and airmen, heroes & heroines”. Two drama workshops were held which resulted in a cast and crew of over 60 people being recruited. Aiming to be totally inclusive, there was no audition process and everyone who attended was given a part in the production. 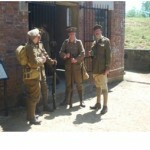 The play was performed on the ground surrounding Reigate Fort, with over 100 people attending each performance. We have been able to interview several members of the public about their memories of the Fort during World War 2, including the plane crash. These are featured in the videos we commissioned. Click here to view. A one mile self-guided Military History walk leaflet has been produced with 1000 copies having been printed and widely distributed.